The state of digital marketing is constantly evolving. In order to keep up with consumers, brands must adapt to these changing digital trends. 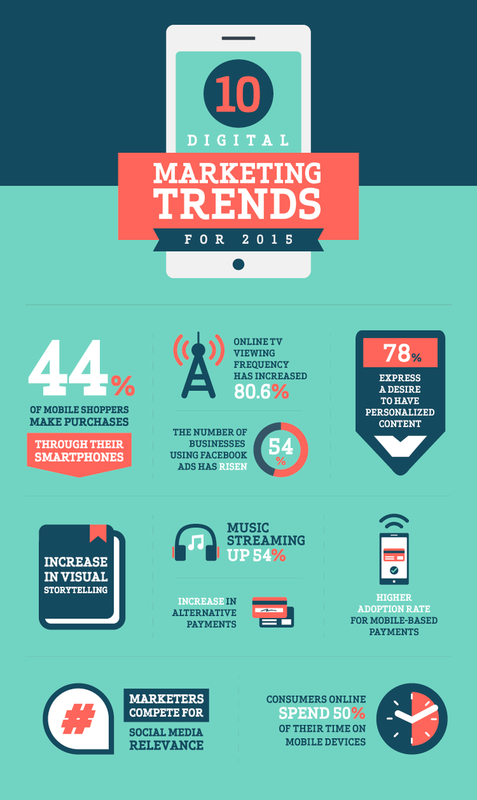 In 2015, mobile will be the hot topic and a key driver for digital marketing success. In the last year we saw the massive ripple effect mobile had on digital marketing, and that is only going to grow in 2015 and beyond. Marketers can expect to see mobile devices surpassing desktop in search traffic, more paid clicks coming from smartphones and tablets, and - as the 2014 holiday shopping season proved with 44% of mobile shoppers making purchases through their smartphones - a spike in mobile shopping. Mobile analytics will become much more important in 2015 as well. Consumers are cutting the cord and choosing streaming video over their cable boxes. With broadcast and cable networks experiencing an 80.6% increase in online TV viewing frequency, even HBO has launched a stand-alone streaming video service that will compete with Netflix. More consumers are consuming video content on YouTube, Netflix, and news websites than ever before. This new digital landscape empowers marketers to deliver video ads to a targeted audience at a much lower price point, making this strategy more affordable and effective for brands. Paid advertising will become the new norm for social media. Marketers will shift to a paid social strategy to ensure content is reaching their fans. In 2014, we saw the rate for social ads on Facebook increase by 54%, and saw other players testing the waters with beta ad programs. Pinterest recently announced it’s expanding its promoted pins to all advertisers, and Instagram is likely to follow. Personalization is making its way into about every form of digital marketing and in 2015, brands will focus even more on messaging and personalization as consumers expect the ads they see to be relevant across all channels. In fact, 78% of consumers express a desire for some kind of content personalization. Our clients will be looking to build deeper connections with their customers, investing more heavily in customer relationship management (CRM), email marketing, automation, and segmentation. By the end of 2015, consumers will expect targeted messaging, personalized to their individual situation. As media consumption continues to move towards mobile, we will see the amount of text on web pages get shorter and visual storytelling emerge as a strategy for nurturing and growing engagement within communities. Web pages will look more like 'billboards' and less like 'word docs,' with punchier messaging, simpler layouts, and a focus on image and video content. A recent study showed that image posts on social media receive 120-180% more engagement than text-based posts, highlighting the importance of visual digital marketing tactics. In 2015, the ability to create strong visuals delivered the right way through digital will define the brands that are winning. Online audio streaming services such as Pandora, iHeart Radio, iTunes Radio, and Spotify are booming in the US, as music fans streamed 164 billion songs in 2014, up 54% from 2013. It's no surprise, mobile has a huge impact on streaming music and listening to online radio. Brands will switch from traditional radio to online streaming in the New Year, which will also easily integrate into their digital campaigns. Alternative payment options can increase the ease and frequency of mobile purchases. Instead of having to fill in your credit card number and billing address, new payment options like Amazon Payment and Google Wallet can complete a purchase from your phone with just a tap of a button. According to ADI, cart completion rates increase by 10% when alternative payment options are available, but this is just the beginning. The 60 seconds that it takes to enter your payment info on a mobile website is a huge barrier to checkout. As technology advances, and you can pay with your thumbprint or one tap, expect to see a huge increase in mobile purchasing. Brands that focus on this one-tap-to-checkout strategy in 2015 will put themselves ahead of the competition and capitalize on more impulse purchases. This one is worth repeating. Over the next decade, a transition will be made towards digital wallets, where our credit cards, ID cards, and grocery cards will be stored on our mobile phone. In the same way we no longer carry our checkbooks around anymore, carrying physical credit cards will become obsolete as well. While this fundamental shift in consumer behavior won’t be complete in the next 12 months, we will see steady progress towards adopting options like Apple Pay, and by 2019 we can expect to see mobile-based payments reach $142 billion. While this isn’t a new term, real-time marketing will be as important as ever in 2015. From Ellen DeGeneres’s Oscar night selfie that broke Twitter, to cultural events such as the World Cup, and brands like Kit Kat jumping on #Bendgate (“we don’t bend, we break”) and receiving a record-breaking 28,000 retweets, look for more RTM and live-tweeting as brands and marketers compete for social media relevance. Mobile optimized websites will continue to be extremely important, and marketers will shift strategies to mobile marketing. With consumers constantly on the go and spending 50% of all online time on their mobile devices, marketers will focus on making their content short, digestible, and attention-grabbing. Published on February 3, 2015 .